As we move towards the 2020 workforce, companies face an interesting demographic dynamic in terms of talent acquisition - a workforce comprised of Millennials, Gen Xers, Baby Boomers and Traditionalists. While each of these groups has their own generational differences, the most notable are the expectations and approaches to work from Millennials, who are projected by 2020 to make up 50 percent of the workforce. The Bureau of Labor Statistics 2014-24 Employment Projections are forecasting total employment to reach 163.8 million jobs by 2024, which means generational differences will increasingly become an additional component of diversity relations at the workplace. As Millennials become the largest segment of the labor force, recruiters and hiring authorities will have to learn what drives this generation during the job search process, and how to keep them engaged once onboard. To learn how recruiters feel companies stand in this process, and compare this feedback with millennial insight, MRINetwork conducted the 2017 Millennial Hiring Trends Study. When asked what methods companies are using to retain Millennials, flexible work options, or the ability to work remotely, was the top pick of recruiters (38 percent). Career pathing was not far behind at 32 percent. More than half of millennials (53 percent) say that career pathing - mapping of incremental progression to new roles in the company - has the most impact on their decision to stay with their employer. This process begins not with the manager, but with the employee taking charge of their performance review and setting their desired career path. Once goals are set, successful completion now rests in the employee’s hands. The path is now clear for what they need to do, in order to be promoted or receive a pay increase. 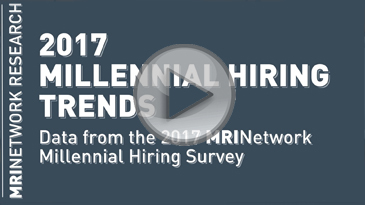 To view the complete Study and a short video on what’s important to Millennials that can be easily distributed to hiring authorities in your organization, visit MRINetwork.com/Millennial-Hiring-Trends-Study.